Another month goes past and summer is slowly but surely on us. We had a sudden cold snap in Mid February with temperatures dipping to 9 degrees Celsisus. Wow that was colder than the winter just past. Unfortunately there have been no rains and the valley is drying up - the trees have started shedding their leaves, the earth is dusty and parched awaiting the firsy showers. With UGADI around the corner one hopes for some rains and that too soon. None of this however makes any difference to our patient load - 1626 patients, 108 eye consults, 11 cataracts, 1 dacryocystectomy and 1 trabeculectomy. One feels happy that all this was possible thanks to some money which accrued over the last month. We have also had a number of "difficult" diagnosis to make and here the power of the web is immeasurabale. Google and particulalry Google scholar have helped in at least pointing out a reasonable path to follow. As ever money continues to be at a premium. HELP!!!!! Venkataramana, 55 year old male a farmer by profession presented to the health centre with c/o sudden onset pain in the Thoraco lumbar region. There was a history of lifting weights. So sudden onset low back ache with a positive h/o of trauma - acute lumbago - treat with NSAIDs and Bed rest??? Standard treatment. Spine: Marked tenderness from D(T) 10 to L2 levels. Paraspinal spasm and worst of all there was pitting oedema in the same area and with deep palpation there was a suggestionof a boggy swelling under the lateral spinous ligament. Peripherally: Absence of fine touch from the D10 - L1 dermatomes. Diminished Knee jerk and superficial abdominal reflexes. There was no bladder dysfunction. So what does one do next. Here the "cut system" of private practice works in our favour. Since we do not take "kickbacks/ cuts" from laboratories/ diagnostic centres we were able to get an MRI spine done fro Rs 2500/- Quite reasonable in today's age. That the MRI was in Tirupathi (120 km) and patient had to be transported there was another matter. 1. Shows a Destruction of D9 vertebral body and posterior bony elements with spinal cord compression. 3. Disc bulge at L4-L5 and S1 with bilateral nerve root compression. No we were in trouble and the only option was a neurosurgical intervention. Managed to get the local MLA to write a letter to SVIMS, a super speciality hopsitla run by the TTD, and hey have promised all help and concession. Luckily, the patient ahs some money and since both his sons earn, they have sold a cow for approximatel Rs 15000 to meet the expenses. As i write this, the patient is on his way to Tirupati for admission. Let us hope and pray that the selling of the cow was worth it. I will update this in due course. Habeeb a 50 year old smoker, migrant worker by profession presented on 09 Feb 2007 with a 2 month h/o cough, whitish frothy sputum, occasional haemoptysis. There was associated loss of weight as well as anorexia with evening rise of fever. Pulse 90/min, BP 110/70 mmHg, Clubbing Gd 1, No pallor. RS: Trachea central, diminished movements Left Inframammary and Infraxillary regions. VF and VR were also diminished, percussion being impaired. There were a few fine crepts. 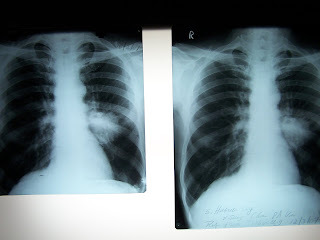 X Ray Chest showed a mass lesion LMZ. HIV (Tridot) which was negative, Random Blood Sugar was 70 mg%, Mantoux was -ve. We were fairly sure that we were looking at a Malignancy but decided to give him a month's trial of ATT with Rifampicin, INH, Ethambutol as well as Pyrazinamide. ATT was started on 14 Feb 2007. He was reviewed on 13 March 2007 with repeat XRay chest. On the Photograph, the one on the right is the recent (12 March) and on the left is the older one (12 Feb). As you can see there is no difference between the two films. We are now trying to convince his sons (2 of them) to raise Rs 1500 for a CT scan which in all likelihood will give us a diagnosis. Then the struggle to find a hopsital and funds for further treatment. This is a daily struggle at the health centre. One feels a sense of impotence to be able to detect diseases but then what? Plead helplessness!